Katherine (my friend’s daughter) has the right idea. 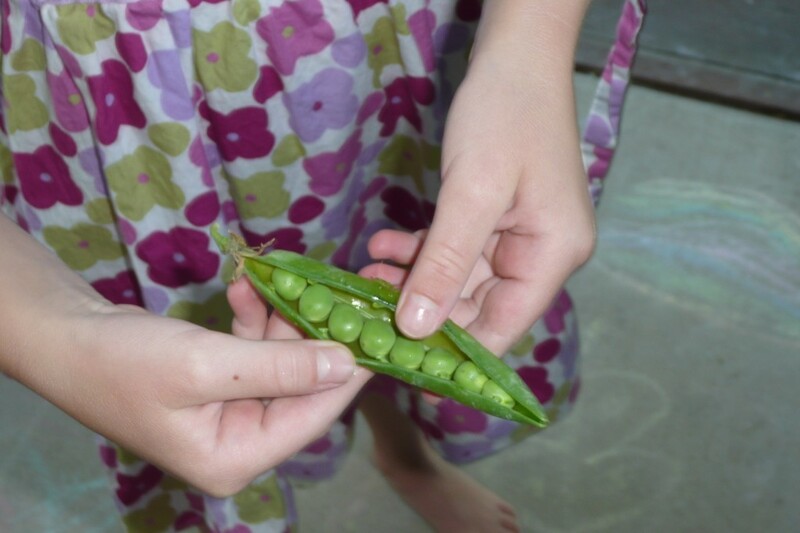 Eat peas while they’re farm-fresh as the sugar quickly converts to starch, compromising the sweet, delicate flavor. Peas are the all-purpose, wonder food. Kids love shelling them and popping them directly into their mouths. Grandmas serve them for every holiday. They’re good in soups, stews, smoothies, stir fries, wraps, spring rolls, salads and rice. Peas are perfect lightly boiled, steamed or sautéed and topped with a touch of butter and sea salt. Use your imagination, you can’t go wrong with farm-fresh peas. Bring a saucepan of water to a soft boil (not raging). Add a dash of salt and the shelled peas. Watch it carefully. You only want to cook the peas for a short time (no longer than 45 to 60 seconds). Cooked, fresh peas are best when they’re tender, but still firm. And definitely not mushy. Drain in a colander, place in a bowl, top with dollop of butter and gently toss. Sprinkle with grated Parmesan cheese. These are wonderful paired with rice or mixed into risotto. Stack your ingredients in a row on your tortilla. Drizzle with dressing of choice and fold. Check here for various folding methods. My favorite for this wrap is the “open ended” method (#3). * This is a perfect way to make a quick, tasty meal and use up various veggies. I like the texture of roasted, chilled beets in a recipe like this, but shredded or thinly sliced raw beets work fine. When I’m in the midst of beet harvest time, I roast several and store them in the refrigerator for salads, wraps and sandwiches. Yes, they’re great on sandwiches, they replace the tomatoes. I’m off for a few days of camping, hiking and mountain biking in the Sawtooth Mountains of Idaho, so I won’t be posting recipes or responding to comments on my blog until the end of the week. I’m not ignoring you — I’m just enjoying the wild blue yonder, complete with homemade dehydrated kale backpacking soup (more about that on Shirley’s GFE “happy camper” carnival at the end of the month). P.S. Photo credits and cuteness courtesy of my friend, Megan. Thank you!